All photos by Nicole del Rosario. Running through the middle of Berlin is the Spree, the narrow river upon which the city’s original center was built. Normally, tourists come here aboard various cruise liners to go sightseeing, for a trip down the river yields phenomenal views of some of the city’s top attractions. Things were different, however, for the MS Alexander von Humboldt on July 22. Instead of its guests hopping aboard the cruise to see Berlin, the main attraction on this immensely sunny evening was on the ship itself: 39 beers from 25 craft breweries, flowing freely on tap. This momentous Craft Beer Cruise marks the official opening of Berlin Beer Week 2016. In this year’s incarnation, the revelries run for nine days straight from July 22nd until the 30th, effectively a novena of sorts paying homage to craft beer. The activities are rather varied, ranging from tap takeovers to beer and food pairings, and even to a beer running club. With over 60 different events taking place at 51 distinct locations in Berlin, the scale of the festival is so awe-inspiringly massive that it’s almost difficult to believe that this brainchild of Flüssigfest Productions is only running on its second year. There is perhaps no grander or more unique kickoff event more fitting of Berlin Beer Week 2016 than the Craft Beer Cruise. 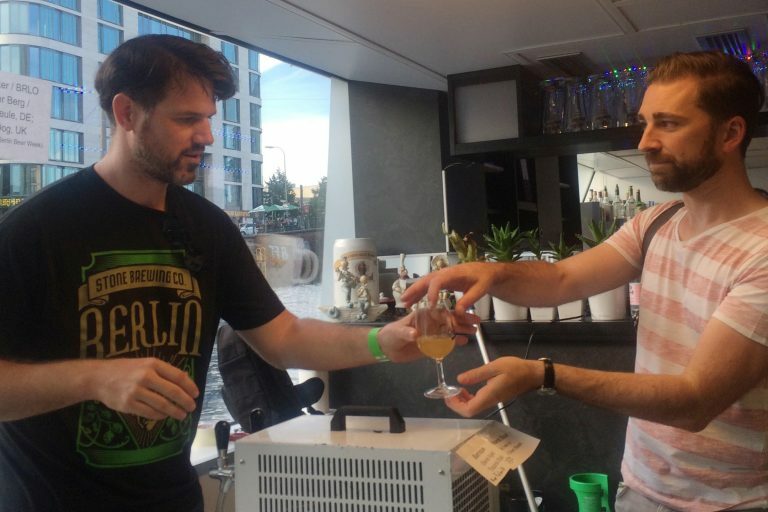 Definitely the first of its kind in Germany, the Craft Beer Cruise was a beautiful three-hour-long journey down the Spree with an equally beautiful array of craft beer choices on deck. With tickets sold out weeks before the event, the cruise drew in a total of 355 beer enthusiasts—or, as the Germans call us, Bierliebhaber—on board the 62 meter long ship. Guests were treated to unlimited pours of beers from various North American and European breweries, styles ranging from crisp and light to rich and heavy. Confronted by the reality of a long list of 39 beers on offer, it was almost oppressive to walk down the deck lined with taps and decide on only one beer at a time. Luckily, my inhuman desire and greed to taste each one kicked in and helped me get through roughly 75% of the list. Of the handful of ales I managed to try, there were five distinct beers which compelled me to go back for seconds (okay, let’s be honest, maybe even thirds): Berlin Beer Week’s Sunburst Sour, Steamworks Killer Cucumber Ale, Stone Brewing's Vertical Epic 08.08.08, Mikkeller’s 12” Wineale, Buxton Brewery’s Yellow Belly Sundae. The Sunburst Sour (4.8% ABV) is the official beer of Berlin Beer Week 2016. A collaborative beer brewed especially for the event, the ale is a work of love that banks on the combined talents of BrewBaker, BRLO, Berliner Berg, Schneeeule, and BrewDog to distill the brightness and vibrance of a Berlin summer into a sip. A lovely Berliner Weisse, the Sunburst Sour is a very fresh, sour beer which kisses the palate with sparks of lemon, honey, and just a dash of salt. On sweltering, sunny evenings like we had early on the night of the cruise, Steamworks’ Killer Cucumber Ale (4.7% ABV) is the perfect drink to cool down. This summer ale carries a remarkable cucumber scent, owing to the organic cucumbers that it is brewed with. The medium carbonation combined with the citrus hop notes makes it almost too easy to drink. Stone’s Vertical Epic 08.08.08 (8.9% ABV) is Belgian Strong Ale that beautifully marries Belgian yeast and American hops into a deep gold liquid perfection. The fruity nose with a prominent banana note is a beguiling counterpart to the zesty flavors that the Amarillo, Ahtanum, and Simcoe hops impart. The finish is wonderfully crisp and leaves an addictive lingering bitter taste in the mouth. I always enjoy a good Riesling, though the thought of it and my beer having lovechild honestly never crossed my mind. Just one sip from Mikkeller’s 12” Wineale (7.7% ABV), however, immediately turned me into a believer. The Sour Ale brewed with Riesling juice is a wonderfully balanced beer with succulent acidity, delectable sweetness, and a light bitterness. My clear favorite of the night was Buxton Brewery’s Yellow Belly Sundae (12% ABV), an Imperial Stout that is just downright scrumptious. The very strong cacao and vanilla nose brought me to my happy place while the chocolate, peanut butter, and biscuit flavors enveloped me like a warm embrace. The very thick mouth feel combined with this gorgeous sweetness make it ice cream in a bottle. The sweetness, however, gradually unfolds into ambrosial bitterness that hooks you in and makes you crave more. There really are few things better than sipping on fantastic beers while soaking up the sun and slowly sailing down the Spree, and all guests disembarked from the beer boat with wide smiles of satiety warming up our faces. Taking the wild success of the Craft Beer Cruise and the impeccable organization of Berlin Beer Week 2016 as indicators of their imaginativeness and efficiency, it’s definitely going to be exciting to see what Flüssigfest Productions cooks up for beer lovers in Berlin at next year’s festival.